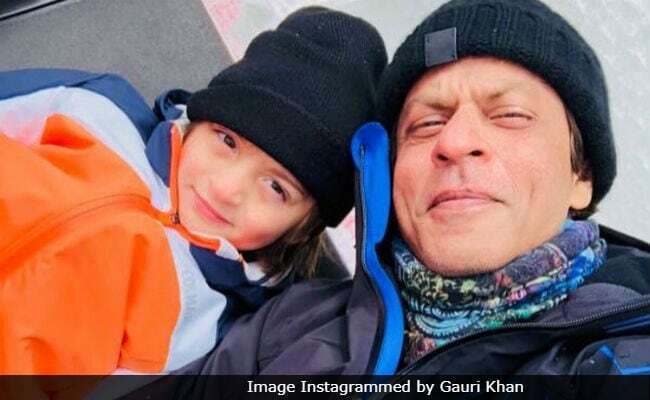 Shah Rukh Khan is arguably one of the wittiest actors in Bollywood and his latest Instagram post featuring his son AbRam reminds us of just that. On Friday night, the 53-year-old actor shared an adorable picture of his 5-year-old son AbRam, who can be can be seen dressed in a statement t-shirt, which has "Mama Is My Queen" printed on it. He can also be seen sporting a cap and sunglasses and can be seen holding an iPad in his tiny hands. SRK described the post in the most hilarious way possible and wrote: "For all the sons of the world... If your Mama is your Queen then there is no stopping you from being The Happy Prince (and an iPad loaded with games helps too)." We simply love it when Shah Rukh and Gauri Khan's youngest son features on his parents' Instagram profiles. Remember the picture from Gauri Khan's birthday celebrations or the time when Shah Rukh, Gauri and AbRam celebrated Janmashtami at their Mumbai home? The list of best SRK-AbRam moments will be complete without Shah Rukh's Father's Day special post. The actor shared a picture of a Father's Day card designed by his little son and accompanied the post with a caption that read: "Notwithstanding that the kids had no other option and yeah I admit maybe there is just a hint of a bias here...this kind of completes a father's life." Notwithstanding that the kids had no other option & yeah I admit maybe there is just a hint of a bias here...this kinda completes a fathers life. On AbRam's fifth birthday this year, SRK shared a super cute birthday wish on social media. "My sunshine turns 5 years today but he thinks he is 9. Please don't tell him otherwise if you meet him," read an excerpt from his post. My sunshine turns 5 yrs today but he thinks he is 9! Please don't tell him otherwise if u meet him. Children should hear their own music, sing their own songs & believe in their own lil dreams...& yeah, hug their papa a lot..
Shah Rukh Khan married Gauri Khan in 1991 and besides AbRam, the couple are parents to Aryan and Suhana Khan. On the work front, Shah Rukh Khan awaits the release of Zero, co-starring Anushka Sharma and Katrina Kaif.